Is this the Internet's next viral kitty star? Meet Meatball (!! ), a 36-pound cat that the Phoenix's Maricopa County Animal Care & Control shelter picked up, after he couldn't fit into a standard kennel. 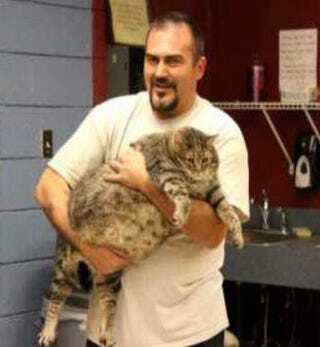 The shelter is trying to find an organization that deals with overweight cats to take him. Good luck, Meatball!